PDP presidential candidate Atiku Abubakar, yesterday, got a complex challenge on his presidential bid — he should drop running mate Peter Obi or be prepared to lose the election. What happened again and what is Peter Obi's offence? The Northern Youths Leaders Forum (NYLF) advised Atiku to review the choice of Obi, if he hopes to earn the North’s support. The national chairman of the group, Comrade Elliot Afiyo, who spoke on Tuesday in Abeokuta, the Ogun State capital, after a meeting with former President Olusegun Obasanjo on Monday night, claimed that the body had been instrumental to the electoral victories of successive presidents since 1999. It claimed to have played a major role in incumbent President Buhari’s victory and it also played a critical role in the reconciliation between Atiku and Obasanjo. Afiyo said the Obi’s choice was causing friction in the Southeast, which is largely responsible for the impending defection of the Deputy Senate President, Ike Ekweremandu, from the PDP. “And for us to ignore the stakeholders, it is political suicidal, so we must agree with that fact. 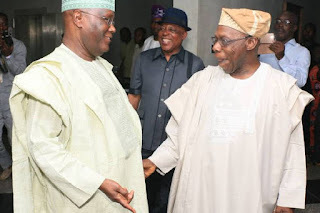 That was what we told Obasanjo, that as far as we want to Atiku to succeed, he has no alternative than to drop Peter Obi and with the contention between Peter Obi’s group and Ike Ekeremadu’s group, it is not political convenient again to pick a running mate from the Southeast. “Then, in the North, we consider Peter Obi as anti-North. This is no sentiment. Apart from the way he treated the northeners when he was the governor of Anambra State, we consider him as a bonafide member and major sponsor of IPOB. He said: “We do not need such distraction now. What we need is joining of hands together as we collectively seek solutions to our problems. “All those that knew Obi very well for what he did in the past, both in his private business and governance of Anambra State... wrote eulogies of him. Researchers went to work. After careful and painstaking analyses of his past, they submitted that he is humble, hardworking, knowledgeable about the economy, aware of the myriad of problems of the country, detribalised and a believe in the unity of the country.